If Italian fontina is not available, use whole milk mozzarella rather than a rubbery Danish, Swedish, or American fontina. We like the mushroom sauce made with whole milk, but both skim and low-fat milk are acceptable. 1. Cover porcinis with water in small microwave-safe bowl; cover with plastic wrap, cut several steam vents in plastic with paring knife, and microwave on high power for 30 seconds. Let stand until mushrooms soften, about 5 minutes. Lift mushrooms from liquid with fork and roughly chop (you should have about 3 tablespoons). Strain liquid through fine-mesh strainer lined with paper towel into medium bowl. Set mushrooms and liquid aside. 2. Bring 3 quarts water to boil in large saucepan. Add broccoli rabe and 1/2 teaspoon salt; cook until crisp tender, about 2 minutes. Drain broccoli rabe and rinse under cold water to stop cooking. Squeeze dry and transfer to paper-towel-lined plate. 3. Adjust oven rack to middle position and heat oven to 425 degrees. Spread portobello mushrooms in even layer on rimmed baking sheet and drizzle with 2 tablespoons oil, tossing to coat mushrooms evenly; sprinkle with 1/2 teaspoon salt and 1/2 teaspoon pepper and toss again. Roast mushrooms until shriveled and all liquid released from mushrooms has evaporated, about 30 minutes, stirring halfway through cooking time. Set mushrooms aside to cool. 4. While portobellos roast, heat 1 tablespoon oil in 12-inch nonstick skillet over medium-high heat until shimmering. Add onions, 1/4 teaspoon salt, and 1/4 teaspoon pepper and cook, stirring occasionally, until onions are browned around edges, about 10 minutes. Transfer onions to large bowl; stir in broccoli rabe and sun-dried tomatoes and set aside. 5. Meanwhile, process button mushrooms in food processor until uniformly coarsely chopped, about six 1-second pulses, stopping to scrape down bowl as needed. Heat remaining 1 tablespoon oil in now-empty skillet over medium-high heat until shimmering. Add chopped button mushrooms and cook, stirring occasionally, until browned and all moisture has evaporated, 6 to 8 minutes. 6. Reduce heat to medium and stir in porcini mushrooms, 1 tablespoon garlic, 1 teaspoon salt, and 1 teaspoon pepper. 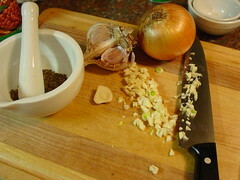 Cook, stirring frequently, until garlic is fragrant, about 1 minute. Add vermouth and cook, stirring occasionally, until liquid has evaporated, 2 to 3 minutes. 7. Add butter and cook until melted. Add flour and cook, stirring constantly, about 1 minute. Slowly add reserved porcini soaking liquid, scraping pan bottom to loosen browned bits. Add milk and nutmeg. Increase heat to medium-high and bring mixture to boil. Reduce heat to medium-low and simmer until sauce has thickened and reached consistency of heavy cream, 10 to 15 minutes (you should have about 4 cups). Remove from heat and stir in 2 tablespoons parsley and thyme. 8. Combine fontina, goat cheese and Parmesan in medium bowl. Toss cooled portobello mushrooms with onions in large bowl. Place noodles in 13 by 9-inch ovensafe baking dish and cover with hot tap water; let soak 5 minutes, agitating noodles occasionally to prevent sticking. Remove noodles from water and place in single layer on kitchen towel. Wipe baking dish dry and coat with butter. 9. Using rubber spatula, evenly distribute 1 cup mushroom sauce in bottom of baking dish; position 3 noodles on top of sauce. Spread 3/4 cup sauce evenly over noodles followed by 2 cups mushroom-onion mixture and 3/4 cup cheese. Repeat layering of noodles, sauce, mushroom-onion mixture, and cheese two more times. Place 3 remaining noodles on top of last layer of cheese. Spread remaining sauce over noodles and sprinkle with remaining cheese. Lightly spray large sheet of foil with nonstick cooking spray and cover lasagna. Bake until bubbling, about 20 minutes. 10. While lasagna is baking, combine remaining 2 tablespoons parsley and 1 teaspoon garlic with basil and lemon zest in small bowl. Increase oven temperature to 500 degrees, remove foil from lasagna, and continue to bake until cheese on top becomes spotty brown, 6 to 8 minutes. Remove lasagna from oven and sprinkle evenly with herb mixture. Cool 15 minutes, then cut into pieces and serve. Leftovers can be wrapped in plastic and stored at room temperature for up to 2 days. 2. For the cakes: Adjust oven rack to lower-middle position; heat oven to 350 degrees. Line muffin pan with paper liners. 3. Whisk flour and baking powder in small bowl to combine; set aside. In standing mixer fitted with flat beater, cream butter, sugar, salt, and lemon zest at medium-high speed until light and fluffy, about 3 minutes; using rubber spatula, scrape down bowl. Beat in vanilla until combined, about 30 seconds. With mixer running at medium speed, add eggs one at a time; beat until partially incorporated, then scrape down bowl and continue to beat until fully incorporated (mixture will appear broken). With mixer running on low speed, gradually add flour mixture; beat until flour is almost fully incorporated, about 20 seconds. Disengage bowl from mixer; stir batter with rubber spatula, scraping bottom and sides of bowl, until no flour pockets remain and batter is homogenous; batter will be very heavy and thick. Using rubber spatula, gently fold in blueberries until evenly distributed. 4. Transfer batter to prepared muffin cups; with spoon, spread batter evenly to cup edges, gently pushing in to fill all gaps, and smooth surface. (Note: Batter will come up to top of papers.) Squeeze handful of streusel in hand to form large cohesive clump; break up clump with fingers and sprinkle streusel evenly over batter. Repeat with remaining streusel. Bake until deep golden brown and toothpick or wooden skewer inserted into center of cake comes out clean, about 35 minutes. Cool until just warm or to room temperature, about 1 hour. 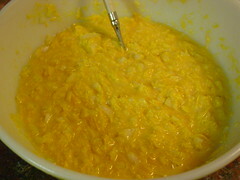 In a bowl, stir together the cornmeal, baking soda, salt; stir in milk, eggs and corn. Stir in cheese and onion, mix until well blended. 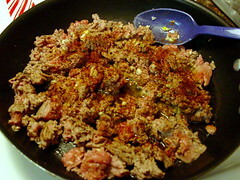 Meanwhile in a large skillet, cook beef until browned; drain. Stir in kidney beans, tomato sauce, chili powder, garlic powder, and cumin. Cook until heated through. 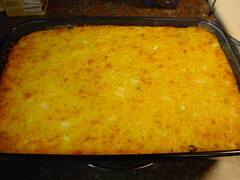 Grease and sprinkle a thin layer of cornmeal over the bottom of a 12x7.5X2 inch baking dish (or a 13x9 dish works too). Turn half the cornmeal batter into the dish. 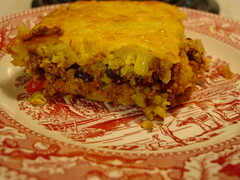 Cover with the meat-bean mixture and top with remaining cornmeal batter. Bake in a 350F degree oven for about 45 mintues or till topping is GBD and done. Let sit 5-10 minutes to cool slightly before slicing. 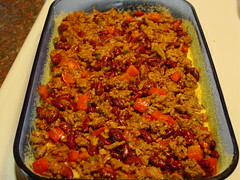 I add 1 jalapeno or pablano pepper diced, fresh garlic, and 1/2-1 red or green bell pepper, or cubanelle pepper to the meat mixture. Also add some garlic powder and onion powder to it as well. I have a deep love for tamales. I'm not sure why that is, but they hold an extremely special place in my heart. Traditionally they are made around the christmas holiday. From Mexican to Guatemalian style, they are all spectacular in my eyes. Someday I will be daring enough to attemmpt to make my own tamales. A large listing of tamale recipes here. I found the Cooking Diva posted on some traditional Panamanian tamale variations. Read all about them here - Tamal de Maiz Nuevo. 101 Cookbooks looks to be a very interesting site. The Kitchen@Apartment Therapy has cool stuff to check out. Grocery Lists found lists and a thing you can download that sorta precreates a list for you. The Doomestic Goddess has a nice assortment of recipes on her site. The Cooking Diva Blog also has some good looking recieps too. Cook Sister writes about cooking from South Africa. The Passionate Cook has loads of good links, pretty images, good info and more. Whatever the box tells you you'll need. Probably eggs, water, and oil. 1) Mix the cake mix as the box says. Again. Physical pain. 2) Place the chipotle peppers in a food processor and puree. Add two tablespoons to the mix. Add the cinnamon. 3) Scoop into cupcake papers. Bake for 15-18 minutes or until cake tester comes out clean. 4) Let cool. Combine the powdered sugar and some cinnamon to taste in a bowl, then place in a small mesh duster thingy that I'm sure has a name but it escapes me right now. Dust heavily with powdered sugar. Place doily or wire rack on the cupcakes to get a pattern if desired. Test Kitchen at Food Network has a blog. I had no idea. Some people prefer their brownies cakey. We developed this recipe to satisfy our craving for a bar that was just the opposite: dense, fudgy and full of deep chocolate flavor. 1) Preheat oven to 350 degrees F. Butter an 8 inch square baking pan or glass dish. Line the pan with parchment paper, leaving a 1/2 to 1 inch overhang on two sides. Set aside. 3) Stir sugar into cooled chocolate mixture until combined. Whisk in eggs one at a time, whisking until smooth after each addition. Whisk in vanilla. Gently fold in flour and salt. 4) Pour batter into prepared pan and smooth top with an offset spatula. Bake until a cake tester inserted in the center comes out with only a few moist crumbs attached, 40 to 45 minutes. Transfer pan to a wire rack to cool completely. For nutty version: Fold in 1 1/2 cups walnut halves, finely chopped, after the flour and salt. Proceed with recipe.